The Award highlights the efforts of athletics directors at all levels for their commitment and positive contributions to student-athletes, campuses and their surrounding communities. Fusco is one of four athletics directors at the NCAA Division II level to be honored this year. "The Athletics Director of the Year Award honors those men and women who are visionary leaders in college athletics," said Nick Carparelli, Under Armour senior director of college sports. "Under Armour is proud to partner with NACDA to facilitate this recognition for the top athletics directors across all divisions." Fusco is now in his 19th year as Senior Director of Intercollegiate Athletics at Sonoma State. 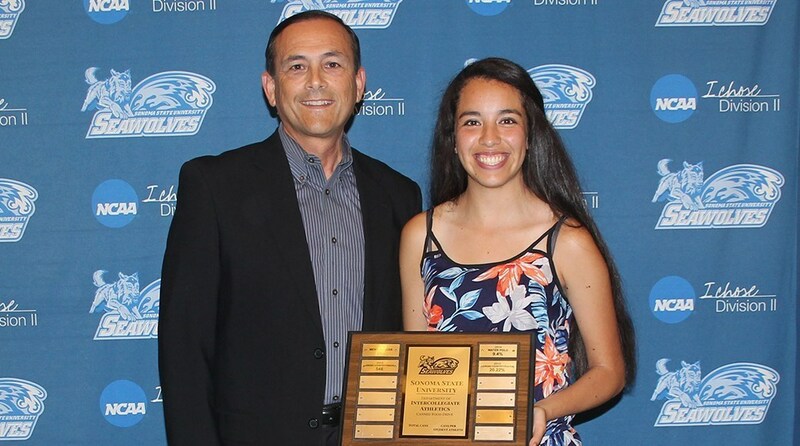 Under his leadership, SSU intercollegiate athletics has grown from 11 teams to 14 with conference affiliation in the California Collegiate Athletic Association (CCAA), Western Water Polo Association (WWPA) and Pacific West Conferences. Fusco has served as president of the CCAA (2004-05) and NCAA Division II Athletics Directors Association (2003), and served four years (1999-2003) on the Executive Committee of the National Association of Collegiate Directors of Athletics (NACDA). Fusco also served on the NCAA Division II Degree Completion Scholarship Committee and the NCAA West Region Women's Tennis Committee, the California State University Risk Management Authority Athletic Injury Medical Expense Board, the NCAA Division II Championships Committee (2007-2011), and was Chair of the NCAA Division II Championships Committee (2010-2011). As part of his duties as Chair of the Championships Committee, he served a one year term on the NCAA Playing Rules Oversight Panel, on which he is currently serving a four year term. As President of the NCAA Division II Athletics Directors Association, he helped develop the Division II Model Athletics Department, a program that establishes the guiding principles of operating a Division II intercollegiate athletic program. Since 2012-13, Fusco has served as a mentor in the NCAA & Division II Athletic Director's Association Women and Minorities Mentoring Program "Mentoring Tomorrow's Leaders." He has over 34 years of combined athletic administrative experience, including positions at University of San Francisco, Dominican University of California and St. Mary's College in Moraga and the University of San Francisco. The award spans seven divisions (NCAA FBS, FCS, Division I-AAA, II, III, NAIA/Other Four-Year Institutions and Junior College/Community Colleges). Winners will receive their awards at a ceremony in June in Dallas. To see the entire list of the 2015-16 Under Armour AD of the Year Award recipients, visit www.nacda.com. All NACDA-member directors of athletics in the United States, Canada and Mexico who met the criteria were eligible for the award. Among the criteria were service as an AD for a minimum of five academic years; demonstration of commitment to higher education and student-athletes; continuous teamwork, loyalty and excellence; and the ability to inspire individuals or groups to high levels of accomplishments. Additionally, each AD's institution must have passed a compliance check through its appropriate governing body (i.e., NCAA, NAIA, etc. ), in which the institution could not have been on probation or cited for a lack of institutional control within the last five years during the tenure of the current athletics director. Nominators were NACDA-member directors of athletics, institutional presidents and conference commissioners, as well as other respected intercollegiate athletics administrators. Special Divisional Selection Committees composed of current and former directors of athletics, current and former commissioners and other key athletics administrators voted on nominees for the award. NACDA, now in its 51st year, is the professional and educational Association for more than 15,700 college athletics administrators at more than 1,700 institutions throughout the United States, Canada and Mexico. More than 5,500 athletics administrators annually attend NACDA & Affiliates Convention Week. Additionally, NACDA manages 15 professional associations and three foundations. For more information on NACDA, visit www.nacda.com. Liz Thach, Master of Wine, has been named Sonoma State University's Distinguished Professor of Wine.